Although relatively marginalised today, William Fox was among the most prolific radical pamphleteers of the 1790s. Between 1791 and 1794, he collaborated with the Baptist bookseller Martha Gurney in publishing sixteen political pamphlets on topics ranging from the abolition of the slave trade to the perversion of national fast days, from England’s war with France to the government’s selective redefining of the word ‘Jacobin.’ His most famous work, An Address to the People of Great Britain, on the Propriety of Refraining from the Use of West India Sugar and Rum (1791), solidified the abolitionist forces in Great Britain and America by focusing their energies on a boycott of West Indian produce, a boycott that served not only as a viable economic solution to ending the slave trade but also, as Charlotte Sussman argues, provided through the power of ‘consumerism’ a kind of universal suffrage for its advocates, resulting in a political campaign that bypassed Parliament and granted power directly to the people, many of whom were of the lower and middle classes. In less than a year, Fox’s Address became the most widely circulated pamphlet of the eighteenth century with more than 200,000 copies distributed in Great Britain and America. Between 1773 and 1794, William Fox operated a bookshop at 128 Holborn Hill, appearing as a bookseller on at least fifty-six titles, although usually as a member of a consortium of sellers. In 1782 he entered into a business arrangement with Martha Gurney (1733-1816), who that year moved her bookshop from 34 Bell-yard into his quarters in Holborn Hill, where she would remain until her death in 1816. She was the only daughter of Thomas Gurney (1705-70), a High Calvinist Baptist who served for many years as a shorthand writer at the Old Bailey. Her brother, Joseph Gurney (1744-1815), was also a bookseller before succeeding his father as shorthand writer for the Old Bailey and later for Parliament. Joseph Gurney may have introduced his sister to William Fox, for the two men, besides being printer/booksellers only a short distance from each other in Holborn, were also subscribing members to the Humane Society, founded in 1774 by Dr. William Hawes, a close friend of Joseph Gurney. In the mid-1780s, Martha Gurney joined the Baptist church at Maze Pond, where James Dore served as minister from 1783-1815. His popular pamphlet, A Sermon on the African Slave Trade (1788), was sold by Martha Gurney. Fox’s church affiliation is not known, but in his pamphlets he made no effort to hide his identity as a Dissenter; it is highly probable he was, like the Gurneys, a Baptist, but his name does not appear in the church records for Maze Pond or any other existing records of the London Baptist churches. In 1794, Fox, along with James Dore, became a member of the Pennsylvania Society for Promoting the Abolition of Slavery. The following year, Joseph Gurney also joined the Pennsylvania Society. In less than a year, Fox’s Address went through twenty-six editions in London and other locations in Great Britain and America. Its publication spawned one of the most strident pamphlet wars of the 1790s. By the summer of 1792, approximately twenty responses to the pamphlet, both pro and con, had appeared in London. The success of Fox’s Address and his follow-up pamphlet, A Summary View of the Evidence Delivered before a Committee of the House of Commons, Relating to the Slave Trade (1792), as well as A Defence of the Decree of the National Convention of France, for Emancipating the Slaves in the West Indies (1794), formed part of a remarkable collection of sixteen highly-charged political pamphlets written by Fox, all of which were printed and/or sold by Gurney between 1791 and 1794, creating a legacy in the arena of radical pamphleteering unequaled by any other duo in the 1790s. The only identification of William Fox as the author of the Address occurs in a footnote in an anonymous pamphlet, A Vindication of the Use of Sugar, and Other Products of the West-India Islands, in Answer to a Pamphlet entitled Remarkable Extracts, &c, in which the writer, speaking of the Address, informs his readers that ‘the Author of the pamphlet in question is well known to be a Mr. F**, formerly an eminent Bookseller in Holborn.’ Until now, this reference to Fox has escaped historians, resulting in a long history in which librarians and bibliographers have consistently confused the pamphlets of William Fox the bookseller with the works of three other individuals of the same name who published between 1796 and 1821. Most libraries have listed Fox’s pamphlets under the name of an attorney, William Fox, who was a devout Anglican, a loyal supporter of the King and the Pitt administration in the 1790s, and an outspoken opponent of political reform and religious dissent. Fox the attorney was the author of four works: The Friend: A Weekly Essay (1796), Remarks on Various Agricultural Reports. Transmitted to the Honourable Board of Agriculture, in the Year 1794 (1796), A Sailor’s Manual of Prayer (1812), and Protestant Thoughts on Catholic Claims (1813). The fact that Fox the booksellers’s works have been attributed to Fox the attorney is most puzzling given their opposing positions in matters of politics and religion. William Fox (1736-1826), the wealthy Baptist merchant and founder of the Sunday School Society, has also been confused with Fox the bookseller. Fox the merchant was, like Martha Gurney, a Particular Baptist, serving many years as a deacon in the Baptist church at Little Prescot Street. The church’s pastor, Abraham Booth, gained considerable acclaim among abolitionists for his sermon, Commerce in the Human Species (1792), which was published on behalf of Granville Sharp’s Abolition Committee. William Fox, Jr., son of William Fox the merchant, has also been confused by libraries with Fox the bookseller. The younger Fox authored five works between 1796 and 1821, but, as he reveals in Sketches and Observations Made on a Tour through Various Parts of Europe, in the Years 1792, 1793, and 1794 (1799), he was not living in England during the time Fox the bookseller’s pamphlets appeared. As historians continue to unlock the complexities of English politics during the turbulent 1790s, especially the role played by political reformers and by reform-minded women, whether Anglican or Dissenter, William Fox, an obscure bookseller in Holborn, deserves his rightful place, along with his printer and bookseller friend, Martha Gurney, in the shaping of a political culture that continues to yield new discoveries today. 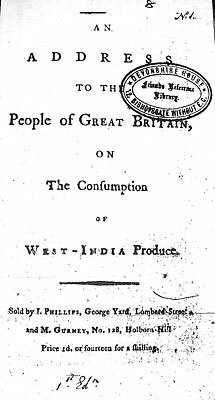 An Address to the People of Great Britain, on the Consumption of West India Produce (London: Printed for James Phillips, and sold by M. Gurney, T. Knott, and C.Forster, 1791). Fox's Address underwent several variations in its title and sellers during the course of its twenty-six editions. The title for the first two editions was An Address to the People of Great Britain, on the Consumption of West-India Produce. For the 3rd edition the title was changed to An Address to the People of Great Britain, Proving the Necessity of Refraining from Sugar and Rum, in order to Abolish the African Slave-Trade; the 4th-5th editions were titled An Address to the People of Great Britain, on the Utility of Refraining from the Use of West India Sugar and Rum; on the 6th-26th editions is the title by which the pamphlet has been most commonly known, An Address to the People of Great Britain, on the Propriety of Refraining from the Use of West India Sugar and Rum. James Phillips appeared as seller with Martha Gurney on the first four editions; on the 5th edition, Gurney appeared with William Darton; on the 6th-13th editions, Gurney appeared as first seller, along with Thomas Knott and Charles Forster; on the 14th-26th editions, Gurney appeared alone on the title page. A Summary View of the Evidence Delivered Before a Committee of the House of Commons, Relating to the Slave Trade (London: Sold by M. Gurney, T. Knott, and C. Forster, 1792). The Interest of Great Britain, Respecting the French War, 3rd ed. (London: T. Whieldon and Butterworth, W. Richardson, and M. Gurney, 1793). An Examination of Mr. Paine’s Writings (London: T. Whieldon and Butterworth, W. Richardson, and M. Gurney, 1793). Thoughts on the Death of the King of France (London: J. Ridgway, W. Richardson, T. Whieldon and Butterworth, and M. Gurney, 1793). A Discourse on National Fasts, Particularly in Reference to that of April 19, 1793, on Occasion of the War against France (London: J. Ridgway, W. Richardson, T. Whieldon and Butterworth, and M. Gurney, 1793). A Defence of the Decree of the National Convention of France, for Emancipating the Slaves in the West Indies (London: M. Gurney, and D. I. Eaton, ). A Discourse, Occasioned by the National Fast, February 28, 1794 (London: M. Gurney, ). Thoughts on the Impending Invasion of England (1794). On the Renewal of the East India Charter (London: M. Gurney, 1794). On Peace (London: M. Gurney, 1794). On Trials for Treason (n.p. ). Poor Richard’s Scraps, No. 1 (London: M. Gurney, [1794?]). Poor Richard’s Scraps, No. 3 [and no. 4] (London: M. Gurney, ). Barrell, John, Imagining the King’s Death: Figurative Treason, Fantasies of Regicide 1793-1796 (Oxford: Oxford University Press, 2000), pp. 1, 81. Coleman, Deirdre, ‘Conspicuous Consumption: White Abolitionism and English Women’s Protest Writing in the 1790s,’ ELH 61 (1994), pp. 348-49. Davis, David Brion, The Problem of Slavery in the Age of Revolution 1770-1823 (New York and Oxford: Oxford University Press, 1999), p. 381. Gratus, Jack, The Great White Lie: Slavery, Emancipation and Changing Racial Attitudes (New York: Monthly Review Press, 1973), p. 74. Kitson, Peter, ed, The Abolition Debate; Vol. 2 of Slavery, Abolition and Emancipation: Writings in the British Romantic Period, gen. eds. Peter Kitson and Debbie Lee, 8 vols. (London: Pickering & Chatto, 1999. Kitson has republished the 11th ed. of Fox’s Address to the People of Great Britain on pp. 153-65. Midgeley, Claire, Women Against Slavery: The British Campaigns, 1780-1870 (London: Routledge, 1992), p. 35. Oldfield, John, ed, The Abolitionist Struggle: Opponents of the Slave Trade; Vol. 3 of The British Transatlantic Slave Trade, gen. ed. Kenneth Morgan, 4 vols. (London: Pickering & Chatto, 2003). Oldfield has republished the 5th ed. of Fox’s Address on pp. 321-33. Oldfield, J. R, Popular Politics and British Anti-Slavery: The Mobilisation of Public Opinion against the Slave Trade, 1787-1807 (Manchester: Manchester University Press, 1995), pp. 56-57. Sandiford, Keith A, The Cultural Politics of Sugar: Caribbean Slavery and Narratives of Colonialism (Cambridge: Cambridge University Press, 2000), p. 124. Sussman, Charlotte, Consuming Anxieties: Consumer Protest, Gender, and British Slavery, 1713-1833 (Stanford CA: Stanford University Press, 2000), pp. 38-44. Whelan, Timothy, ‘Martha Gurney and William Fox: London Baptists and Radical Politics, 1791-94,’ in Pulpit and People: Studies in 18th Century Baptist Life and Thought, ed. John Briggs (forthcoming, Paternoster Press, 2008). Timothy Whelan, Ph.D., is a Professor of English at Georgia Southern University, Statesboro, GA. He has published widely in Romanticism and English Nonconformity, 1750-1830, including several Baptist women writers of that period.